The Christmas cookies I remember best from my childhood were affectionately nicknamed "Devil Bars" by my family. They were called this due to the fact that whenever my mother made them they were impossible to stop eating because they were so delicious. 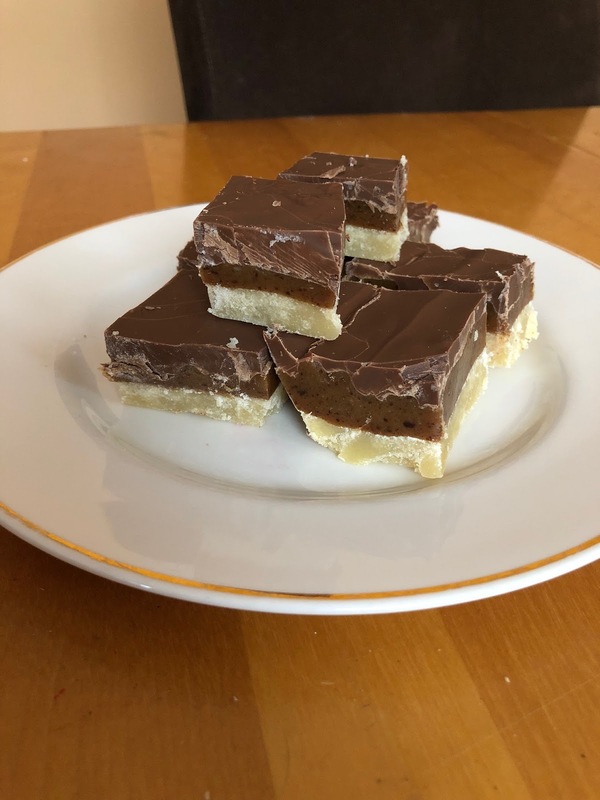 The base of this cookie is shortbread, a thick layer of caramel lies in the middle, and the bar is topped with milk chocolate. I always make Devil Bars over Christmas, and this year is no acceptation. They freeze well and are easy to make. The caramel is the trickiest part, but using condensed milk makes it much easier than making it from scratch, and it may even be more delicious. I find it is best to make them the day before and leave them to chill in the fridge overnight. Place chocolate in a microwave-safe bowl. Heat for 1 minute, then stir and continue to heat and stir at 20 second intervals until chocolate is melted and smooth. Pour chocolate over the caramel layer and spread evenly to cover completely. Chill in the fridge overnight. Have you ever eaten this cookie? What do you call them?